Stroud’s study “examines how notions of what constitutes Brazilian popular music have been constructed over a period of forty years or so since the mid 1960s” (p. 1). Under the “distinct impression” that “the influence of an essentially conservative group of writers and journalists . . . continues to exert a particular influence on public perceptions of a tradition of national popular music” (ibid. ), the author aims to consider the role of these and other actors (the record industry, the broadcasting industry, the state, academics and individual researchers) who have shaped current notions of what is understood as Brazilian popular music, and what isn’t. One of his primary intentions is “to identify the influence of those actors in delineating the parameters of Brazilian popular music, and more particularly the construction of a tradition within the wider sphere of popular music as a whole, that is, Música Popular Brasileira (MPB), the socio/cultural/musical movement that has dominated the artistic scene in Brazil since the mid 1960s” (pp.1-2). The book consists of seven chapters. Chapter 1 introduces the theme of musical nationalism, a fundamental category for the understanding of Brazilian popular music debates. The chapter also discusses the related subject of ‘cultural invasion’. Chapter 2 examines the formation of the idea of MPB and intends to describe the respective roles of those who the author believes “have been the principal architects of its construction” (p. 7). Chapter 3 investigates the close relationship between television and popular music in Brazil. Chapter 4 is dedicated to theories of cultural imperialism and globalization and whether they can be successfully applied to the Brazilian situation. The chapter also examines the role of the Brazilian record industry in the process of ‘cultural invasion’. Chapter 5 addresses the intervention of the state as a cultural mediator. Chapters 6 and 7 are also dedicated to the roles of cultural mediators, exploring oppositions between several different individual and institutional projects in the shaping of the tradition of Brazilian popular music. Chapter 6 considers Mário de Andrade’s major and everlasting influence in the constitution of a mentality of “authenticity” and opposition to mass-mediated music since the thirties. The same chapter deals with Marcus Pereira’s collections of recordings produced in the 1970s, which were oriented towards a broader conception of what constitutes Brazilian popular music. Finally, Chapter 7 discusses two major ventures undertaken by Hermano Vianna and Itaú Cultural, presented as a “totally different perspective on the validity of musical ‘authenticity’ and the role of tradition in Brazilian popular music” (p. 8). MPB represents the concerted effort of a specific class within Brazilian society to define and express itself. That MPB was profoundly bound up with the history of the Brazilian middle class from the mid 1960s onwards is evident from its consumer profile, its political and ideological importance (during the period of the military dictatorship), and the various persistent interventions in support of MPB by actors such as the ‘musical class’, researchers and critics. 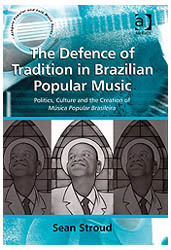 At the same time it is important to note that not only there is a striking lack of support for Brazilian popular music at the state, institutional and academic levels but also that beyond the confines of the middle class the wider Brazilian public now appear to have minimal interest of MPB as a symbol of national identity (p. 186). Stroud’s book is the outcome of serious research. Brazilian popular music is a difficult matter to grasp because the country is so large, with so much musical and cultural variety. Also, this music has long been deemed so fundamental for the understanding of Brazil that many scholars from virtually all areas have been writing copiously on the subject, generating a wealth of references that must necessarily be consulted by anyone who wishes to deal with the subject. To his advantage, the author learned Portuguese and did a good job absorbing this large corpus, emerging with a plausible view about the relationships between Brazilian popular music and culture. MPB should not be understood as a genre or style, but rather as a sociocultural category of music initially produced and consumed primarily by urban, university-educated middle-class types who were, in general, committed to the defense of “authentic” Brazilian music and who opposed military rule (Dunn, 2003, p. 149). Derived from the intense debates involving intellectuals, scholars, journalists, and artists in the highly polarized context of the sixties (when the country was under a right-wing military dictatorship), this narrative fails to take into account several important aspects that may expose its frailties. First of all, the music is conspicuously absent from the debates led by those renowned historians, literary critics, and social scientists in the sixties and beyond, and by Dunn and Stroud as well. All they are interested in is the verbal discourses about music. And examination of music itself (musical discourses) drastically changes the picture. As I have discussed extensively (Neder, 2007), MPB is a complex set of musical practices that continue to puzzle musicologists. As Dunn mentions, it cannot be described as a genre or style. MPB uses genres associated with a) poor rural communities from the Northeast such as xote, forró, baião; b) disenfranchised urban communities such as samba; c) doleful songs that are in direct lineage with 19th century modinha; d) “modern”, cosmopolitan genres such as jazz and bossa nova; and many more. a social signifying system rather than an autonomous set of stylistic traits, [and I employ] an approach to musical analysis that construes musical details as significant gestural and syntactical units, organized by narrative and other formal conventions, [which] constitute a system for the social production of meaning – a discourse (Walser, 1993, p. xiv). If musical genres are discourses, then individuals are able to identify with such discourses, and this is easy to prove. Very often, appreciation of a genre – for instance, rap or punk rock music – is accompanied by the adoption, by the subject, of the sartorial, behavioral, and linguistic codes associated with that genre. Music, in that context, powerfully conveys systems of belief and contributes to the production of subjectivity. Consequently, the appearance of popular genres in MPB should point to disenfranchised communities that wanted to see themselves represented in the public arena constituted problematically by mass media. It is important to notice that in the early 1960s, when MPB was being brewed, there was a large movement of inclusion of the masses in the political process known as Reformas de Base (base reformations), with which President João Goulart was deeply committed. This period is often described as “the masses’ ascension” (ascensão das massas), that was undercut by the coup (Bandeira, 1978, p. 165). It is not impossible that the otherwise inexplicable emersion of a multitude of popular genres in MPB (especially after the monologism of the highly influential bossa nova) was an outcome of this desire of the larger population to be heard. Although the polarized discourses from the sixties, dominated by middle-class intellectuals, forced the notion that the absorption of such popular genres by MPB was a “populist” maneuver by middle-class artists following the directives of the Communist Party (PCB) that they should approach “the people” (o povo), such notions are difficult to prove through careful listening of the records of that period. In 1963 (when there was no talk of MPB yet), for instance, Elis Regina (who would be one of the biggest icons of MPB) included in her release Ellis Regina (Regina, 1963) the song “Silêncio”. The song, in the traditional-percussive samba style, is outstanding in her discography, until then dominated by romantic, juvenile American, South American, and Caribbean genres. The lyrics make reference to a “new beat”, evidently pointing to the recent demise of bossa nova. Ellis Regina is not an MPB album but it shows that subaltern communities were finding their way to the mass media through their musical styles. Regina was trying to approach traditional samba, associated with the lower urban classes of Rio de Janeiro and São Paulo, with no political intentions but solely trying to find a commercial way out (Neder, 2007, p. 301). This way out was successfully found by Jorge Ben in the same year with his Samba Esquema Novo album (Ben, 1963). This album – that in my view was the very first to be recognizably MBP, even before the label or the idea existed – employed several techniques of American black music, such as falsetto (which contradicts the idea that MPB is intrinsically “nationalist” or “anti-American”). Ben, who dwelled in a slum, could hardly be put in the category of a middle-class university student, even less on that of a politicized anti-American. The album heavily employs the maracatu, a then obsolete genre created by slaves. Ben had had contact with this music in his childhood in Recife. In spite of the stylistic aspects that undeniably attest to the belonging of this album to MPB and of its 100 thousand copies sold in three months (a highly respectable number in 1963), Ben – who is black and from a subaltern class – is never presented by hegemonic historiography or criticism as the first MPB composer/performer, a title reserved for the white, middle class Edu Lobo for his song “Arrastão”, launched in 1965 at the I Festival Nacional de Música Popular Brasileira da TV Excelsior: “‘Arrastão’ became a watershed, provoking the appearance of a modern popular music, whose initials are MPM” (Mello, 2003, p. 67). (“MPM” became later known as “MPB”). Perhaps, along with some disguised racism, one could see in this refusal to acknowledge Ben’s role as an MPB artist an attempt to make this music conform to a preferred sociological and ideological narrative? As it would be improper to classify Ben and Regina – and their listeners – as politicized nationalist university students fighting against the dictatorship and the USA, it is also hard to support the idea that MPB is a phenomenon restricted to Rio de Janeiro and São Paulo middle class students, as the canonized narrative goes. As a young boy of 6 in the distant and isolated Campo Grande, Mato Grosso do Sul in 1968, I can attest to the popularity of MPB songs there and then, broadcast intensely by radio due to the famous festivals that enchanted the whole country. However, as far as I could learn, there was no prevalent link among those songs, the middle class, and the political and social discourses with which they became associated. Still today there is no research on the reception and uses of MPB in the larger Brazil in the sixties, and much care is needed to generalize the discourses which emanated from Rio and São Paulo. Through these considerations – extremely summarized here – one can perceive that MPB can only be construed as an exclusively “sociological”, “middle-class”, “nationalist”, “student”, “Rio and São Paulo” thing by careful selection of aspects that may corroborate these affirmations and exclusion of the ones which may not. On the contrary, MPB in the sixties should be seen as a particularly happy moment when different traditions – “high” and “low”, “erudite” and “popular”, oral and written – and communities met in the public realm to dialogue through the democratic yet contradictory space delimited by popular music. Stroud’s book is highly recommendable for its penetrating analysis of some key discourses that have been shaping public policies regarding popular music in Brazil. Such discourses effectively influenced the production and reception of this music, even if they had neither the omnipotence of defining it nor of crushing active, different, resistant, and marginal understandings of what MPB was in the sixties. Also, the examination of recent musical enterprises is a welcome addition to the scholarly debates on what direction such initiatives should take. Stroud is correct when he points to a more fluid notion of national identity in Brazilian popular music today, which has changed the way the label MPB has been appropriated – a phenomenon which demands further study. The aspects of the book that generate polemics are even more important, to the extent that change can only come through conflict, not through conciliation. Mello, Z. H. (2003) A Era dos Festivais: Uma Parábola. São Paulo: Ed. 34, 3rd ed. This entry was posted in News by . Bookmark the permalink. We have a review of this coming out in the next issue of Perfect Beat journal.